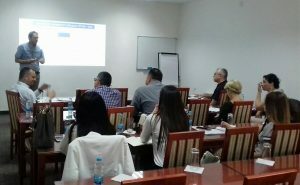 The first workshop on topic “Project Cycle Management” was held within the inter-municipal project “LocalInterAct Network” in Laktaši today. The workshop was attended by representatives of the municipalities of Laktaši, Derventa and Prnjavor. Engaged experts will train municipal teams for preparation of development projects using the Project Cycle Management (PCM) methodology as well as for preparation of applications for the use of external funding sources. In the forthcoming period, municipal development teams will also be informed about available sources for financing municipal, inter-municipal and cross-border projects, as well as about potential partners for implementation of these projects.